Today it feels and looks like October. The sky is dark and overcast. A north wind rustles the forest and makes the dogs want to run and misbehave. Twilight lasts about 10 minutes now, and the sky no longer remains light long after sunset. Fall is tightening its hold. Yesterday was a good day for migrating. I’m not talking just about raptors, though I suspect plenty of them were moving south, too. Around the cabin, I saw little birds, songbirds, in small groups of 6 or 12 heading south, dropping into the trees near sunset to roost. I found an eastern phoebe in one of Roundtop’s parking lots, the first time I’ve seen one in that spot all year. I suspect that bird was a migrant and not one of the summer residents. Most were sparrows, but as they didn’t alight near me, I never got a chance to identify them. Spring and fall are such dynamic seasons, with changes in the air or on the ground visible daily. Stay inside for a day, and you miss a lot. That’s such a change from summer and winter, which both feel more static to me. It takes a while for me to catch up and get used to the speed of the season. I think both summer and winter can lull me into a false sense that time doesn’t move very much. Then fall or spring comes along, and the world moves in overdrive. I’ve been thinking a lot lately about inside versus outside. I was reminded of the differences again last evening when I settled down for the night and turned out the light. Within a minute or so, the wind picked up, and the trees danced back and forth. I could see the action from the large window by my bedside. I could hear the wind through the open window. But I couldn’t feel the wind, so the result was a bit like watching a large-screen TV with a good sound system. Even living in a cabin in the woods is not anything like living IN the woods. It’s true I can be in the woods faster than almost everyone just by stepping outside, but inside is still inside, and I have to go outside, just like everyone else, to really experience the outdoors. I spend a lot of time around people who are rarely outside, let alone in the outdoors. Their experience of life is much different than mine, often different in more ways than I can even imagine. One difference I did discover the other day when the air conditioning went out in my office. Now, the day wasn’t hot, and the temperature inside went up to 80-82 degrees. I consider that warm but not terrible. Well, you can not believe how people reacted. They unlocked our building’s security system and propped open the doors. They whined. They were dripping in sweat. I continued working on as always and didn’t really notice it much at all. But later, I realized that these were the same folks who are rarely outside, who go directly from their climate-controlled houses to their attached garages and their only outside time is the short walk from the office parking lot to the office. How can the outdoors, the real Outdoors, be experienced and understood by folks like these as something beautiful and important? In their day to day lives, they are so far removed from the experience that I don’t even know where to begin to try. If they find 80 degrees so vastly uncomfortable, the number of days when they can safely and comfortably begin to experience the outdoors is already severely limited. And if it’s one thing I am convinced of, it’s that if people don’t have a good experience when they do go outside, they will be even less likely to repeat the experience. And since "those folks" vastly outnumber me, "those folks" are the ones whose opinions will matter when decisions about land use and forests are made. So once again, I am left with questions and no answers. I do what I can, but I feel my voice is as small and as unheard as the sound of wind through the forest at night. Rain soaked Roundtop Mountain this weekend, a hard, chilly rain on Saturday heavy enough to wet through two raincoats. On Sunday the weather went from rain to sun and back again so many times that I couldn’t keep track. The weather limited my forays into the woods. I prefer to avoid mud, as a rule. I’m fine with dirt and snow, but mud isn’t high on my list. The rain seemed to hurry along the ongoing drop of hickory nuts and acorns. Whenever a nut dropped onto a hard surface, the sound was loud enough to wake Baby Dog. She always woke up barking, no doubt expecting some attack by squirrels. We had a quiet weekend, dogs lounging for most of the day, me brewing cups of hot tea and enjoying the solitude. Even the local birds were mostly in hiding. Perhaps we are all hunkering down in sort of a dry run for the winter ahead. Perhaps we were all just lazy. The quiet was nice, for a change. 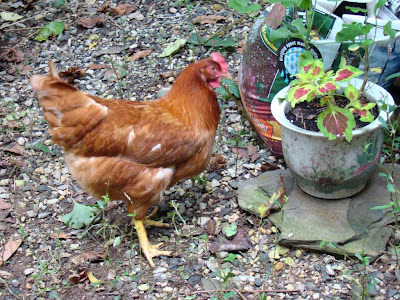 I was awakened this morning at 5 a.m. by some serious chicken squawking. So I grabbed my flashlight and focused it through the bedroom window and on the chicken pen. The girls were all worked up about something, but I didn’t see anything bothering them. Then I put on my flip-flops and went outside to be sure. They were still unhappy but I didn’t find anything and went back to bed, not to sleep, but I went back to bed. The girls likely did see something, probably a raccoon or one of the foxes. Since I’ve had them I’ve discovered that chickens are a lot smarter than I expected. I’ve also learned to interpret the many noises they make. The noise they made this morning was the "big, bad something is after us" noise. They also have a call for the old, stray cat that sometimes wanders through. That’s the "I see you and I don’t like you, but I can take you" call. 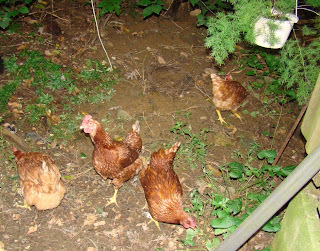 When I get home in the evenings, I usually let the chickens out of their pen. They scratch their way around the cabin and up the driveway. Sometimes they come when I call them back if I have food in my hand. Sometimes I have to pick them up. A couple are starting to think scratching in the woods is more fun than scratching in the driveway, and I have to keep an eye on them to make sure they don’t wander too far or out of sight. The chickens are also better flyers than I expected. That’s one of the things they love to do when I let them out. They fly up the driveway or onto a low branch. Then they sit there looking all proud of themselves. Right now I'm getting a lot of eggs from the girls. That will slow down or even stop for a while during the winter. And their evening woodland forays will end before long, as it will be dark when I get home. I haven't told them about that yet. Wild grapes, also called fox grapes, are looking pretty ripe on Roundtop right now. It looks as though they will be especially abundant this year. In fact, the year is looking like a good one for various nuts of just about all kinds—especially hickory nuts and acorns, which are regularly and loudly falling onto the roof of the cabin right now. The wild grapes native to the eastern U.S. are the starting stock for Concord grapes, I’ve read, and when I look at these tiny purple bunches of them, I can see that. And tiny is what they are, though the photo makes them look larger. A fox grape is about the size of a baby pea. 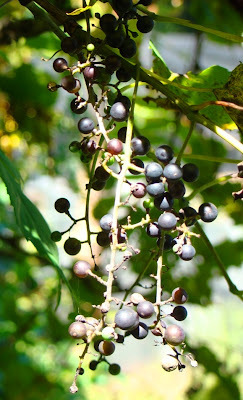 I’ve been told that there’s a poisonous grape called Canadian Moonseed that looks very similar and has much the same range. However, you can tell the two apart by the seed. The moonseed has a seed shaped like a crescent moon (hence its name). Fox grapes have a round seed. I’ve never found the poisonous variety here on Roundtop, though I don’t go around checking every plant I see either. Eating moonseed grapes can be fatal, so if you are inclined to eat fox grapes, I would check a seed in every bunch to make sure you’ve got the right ones. Apparently, the moonseed grapes have a "rank" flavor, too, and why anyone would continue to eat something that’s rank is beyond me. Fox grapes are not rank. Mostly, I don’t eat fox grapes, though I have tasted them. Sometimes they are great, sometimes they don’t seem to have a lot of flavor. Animals love them, and I’ve found it’s uncommon to get to a ripe bunch before some bird or, well, fox. They look pretty, though, don’t they? The forest provides berries in the spring and now that it’s fall, the animals will eat their fill of fox grapes. The forest has its own kind of harvest season. So how do you celebrate fall? Fall is sneaking in on Roundtop Mtn., one leaf at a time, one plant at a time. It reminds me a bit of a stray cat that’s looking to become a house cat. Each day it’s a bit more bold, a bit further in the door. Today, the red of the rose hips caught my eye as I wandered around the woods. 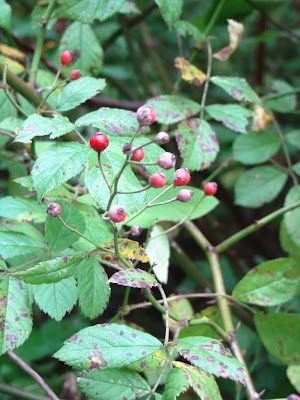 Rose hips are used in a variety of things, from jams to teas to oils. All of the recipes sound too labor intensive for me to bother with. My idea of food preparation usually involves as little preparation as possible, except for coffee, where I never take shortcuts. Will today be the last warm day of the year? It could be. Thunderstorms are predicted for later today but once the storms are through, the temperature is to drop about 10 degrees and spend at least the next week somewhere shy of 70 degrees during the day. In celebration of the season’s change, I am wearing my sandals for the last time before they get put away until springtime. I suppose you could say that wearing sandals is a funny way of celebrating the equinox and the new season, but there you have it. Our ancestors built Stonehenge and aligned giant rocks by hand just so, and I’m wearing sandals. That doesn’t seem like an advancement, does it? From my point of view, it’s an important step to put away the summer clothing that must be worn during summer’s heat and move on to clothing that’s sturdier and comfortable and can be layered or not as the day allows. So let our ancestors have Stonehenge, I’m getting out the fall sweaters. As I was away from the cabin while I was hawkwatching, now that my routine is returning to normal again, I am aware of how much has changed around the mountain in just a few days. The number of leaves that are yellow increased quite a bit, though the yellowing is still mostly in the smaller plants of the forest understory. The trees are still largely greenish, though more and more are starting to look, if not yet yellow, at least no longer summery green. Even with this changing season, some plants are still flowering. 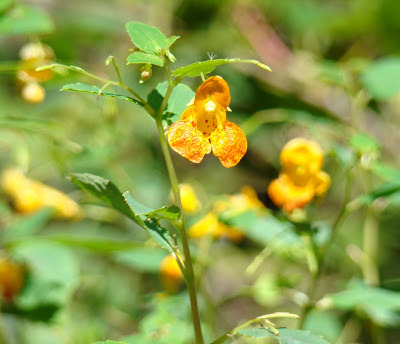 The most profuse around Roundtop right now is the spotted touch me not, perhaps better known elsewhere as jewelweed. This is a plant that is native to North America, but has now also traveled elsewhere, notably England and Europe, which is somewhat novel, given the number of non-native European-based plants that now thrive here in North America. Jewelweed is not the only flower I’m seeing right now, though every day I see fewer. Here and there I find a single daisy, a withering blue or white aster. Goldenrod blooms, as does Queen Anne’s Lace, but the season of flowers is passed and today’s equinox marks the start of new one. So while I have a few flowers yet remaining around the mountain, I will enjoy them. Soon they will all be gone, and it will be six months before the new ones make their debut. 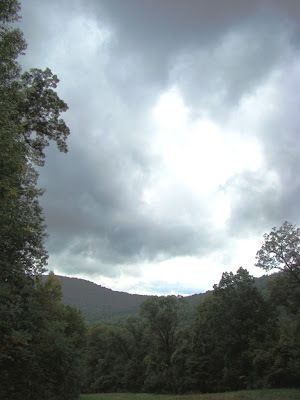 Today’s photo is how the sky has looked at the cabin (and elsewhere) for the past few days. Isn’t it lovely? The sky is the deepest, bluest sapphire blue. Not a cloud anywhere. Try looking into this sky all day long hoping to see hawks. This is the kind of sky hawkwatchers hate. Clouds are what hawkwatchers like. Clouds give some depth to the sky, and help us locate hawks in the sky. When the sky is like this, human eyes find it difficult to focus and spot birds. Are you looking for distant birds, close birds? The eyes have trouble find the right focus and depth to spot birds. Clouds also help provide directions to hawkwatchers about where to look for a hawk that someone else has spotted. "There’s a kettle in that third puffy cloud." "The bird is moving in to that gray wispy cloud." These directions make sense to hawkwatchers. So what do you say when the sky looks like today’s photo?. "It’s in the blue,"—a dreaded phrase if ever I’ve heard one. So this sky is what hawkwatchers were faced with this past week and weekend during the height of the Broad-winged hawk migration. Still, we managed to see and find good numbers of hawks. At Waggoner’s Gap some 1,500 Broadwings, mostly distant birds, were counted on Friday. It was great. We saw large groups (kettles) of birds, birds in onesies and twosies. We saw close Sharp-shinned Hawks, nice numbers of Ospreys, a few kestrels and it was tons of fun. And now, Broadwing season is over. Soon, the Sharpies will dominate, and then Redtails and late in the season will come Golden Eagles, and if we’re lucky, goshawks and Rough-legged Hawks. Hopefully, I’ll get back onto the lookout for all of that, too. Fall feeds the air today, bringing overcast skies and a damp chill to Roundtop this morning. I welcome the coming season. I love how different the seasons are and how each makes the mountain seem like an entirely different place. In a way, the changing seasons help to curb my wanderlust. If I wait a bit, I will be in a different place, and won’t even have to travel or move to go there. This morning, I feel as though the trip has already occurred, and I am now in my fall residence. The color change to the leaves is still a work in progress, but the air feels right. The dogs are restless and antsy, suddenly anxious for long walks--a far cry from midsummer when sprawling on the cool stones passed for exercise. Overnight, the cats want to sit on my lap again and crowd my bed. I’m thinking about soup for lunch instead of salad. See? Everything is different. My posting will be haphazard the rest of this week, I expect. It’s time for Broad-winged Hawks to migrate, and I plan to be on a hawkwatch as much as I can. I should also mention that the Hawk Migration Association of North America started a team blog this week called Hawk Migration Notes. I’m one of the writers, and if you are interested, feel free to check us out. We will be posting two-three times a week during migration on topics relating to hawks, hawk migration and HMANA. This fall is already turning into a very interesting one for me to watch. The change from green to yellow progresses noticeably a little bit more every day. This year I can’t say that dryness is a factor, nor can I say that cool nights are speeding up the process. The forest is anything but dry this year. The night time temperature is pretty average and still flirting with 60 degrees. So despite having every weather advantage that could extend the summer season, the forest still knows it is time to begin changing from green to yellow. I fully expected the green color to last longer than usual this year. The forest still hasn’t taken on that dull green shade usually prevalent in late summer. The forest still looked as though it was mid-summer right up through Labor Day. 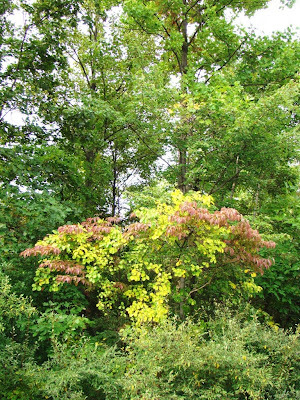 Since then, however, the leaves have begun changing their color, going directly from a deep green to yellowing, without much of that dull shade of green evident at all. Now it’s true the fall season is still very early and the leaves haven’t yet fallen, so it is possible the leaves will eventually hang on for longer than usual. But the evidence I see in the forest today is that the season is changing and it’s pretty much right on schedule. So I’m left with the idea that the shortening hours of daylight plays far more of a role in when the leaves change than does moisture or temperature. Those two factors may not even be real factors at all, since this year both seem to be at optimal levels for extending the season, and yet the yellowing is still on schedule. The forest always has lessons to teach, in every year, in every season. I never tire of learning them. I doubt I ever will. 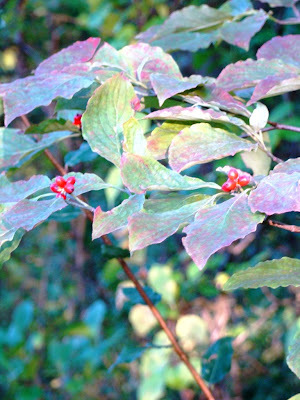 Today's photo are dogwood berries, the first red shade I've seen in the forest this season. The morning was still fully dark when Dog and I took our walk today. Not even a hint of dawn colored the eastern sky. Orion was high overhead. Today was the first I’d seen this warrior-protector since last spring. 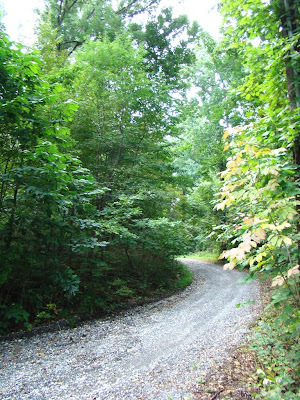 If I’d been awake at 2 or 3 a.m. and walked down the lane to where the woods opens to the sky, I would have seen it months earlier. But that didn’t happen, and today marked the first clear morning when it was still dark enough for me to see the constellation. The clear morning was a continuation of yesterday’s clear sky, which you can see in today’s photo. 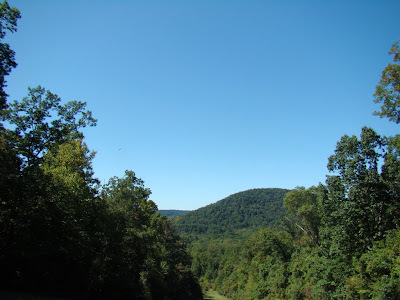 I was hawkwatching up on Waggoner’s Gap again, staring into the blue sky and looking for hawks. I knew it would be a good day, as that nasty east coast storm finally moved off and after two days of rain finally allowed the birds to fly. It was a good day, but it would have been better with a few clouds in that sky. The one-day record for Bald Eagles at Waggoner’s Gap is 30, and for a few hours yesterday, it looked as though the record might fall, but in the end it didn’t. 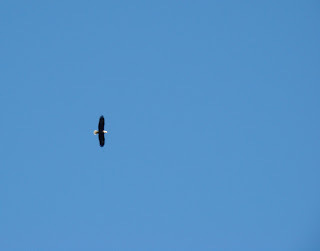 Still a day when 28 Bald Eagles are seen can’t in any way be termed shabby. Back 25 years or so ago, when I hawkwatched almost exclusively at Hawk Mountain Sanctuary, a group of the regular hawkwatchers had a habit, after the day’s hawkwatching was over, of toasting each eagle we saw that day with our alcoholic beverage of choice. It was a rare day to see one, much rarer still to see 2 or 3. We gave up the practice about the time when 7 were seen on one day. Back then, the thought of seeing 28 in a single day wasn’t even dreamed about. Today’s photo was taken atop Waggoner’s Gap looking south towards Roundtop. Roundtop is the second bump from the left side of the shot. I’ve always wondered if I turned on all the lights in the cabin, if I could spot the lights from this distance. I know I couldn’t now, with all the leaves on the trees. Perhaps I’ll try that later when the leaves are down. In the span of less than a week, the pace of yellowing in the forest around Roundtop is picking up, especially in the understory. When I look closely, nearly every one of the smaller plants has some level of yellowing. 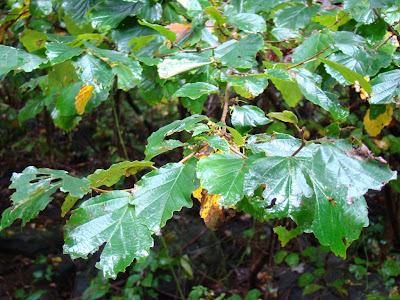 On some it may be a single leaf, or it may be the edges of many leaves, or the lowest leaves may be yellowing. Last week, the forest still looked like July. Today, it doesn’t. It looks more like a combination of August and September. With rain pouring down at the moment, it’s even possible that a few leaves will drop, forced down by the weight of the raindrops. I am especially attuned to the pace of that because every leaf that falls opens up the sky around the cabin a little bit. I am ready for that part. I appreciate the new variation in the color of the forest. Green is a lovely color, but even a lovely color in monochrome loses its appeal after a while. That goes for life too. Whether it’s a daily routine that doesn’t vary or the people we are around, too much sameness soon grows into a rut. Sometimes I think fall is nature’s way of reminding me that change is not only a good thing but something to seek out every now and again just for its own sake. 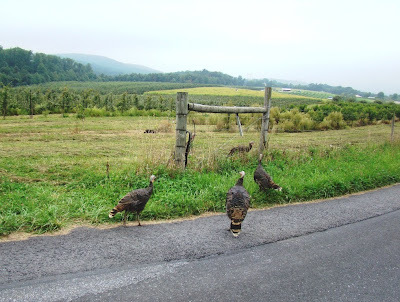 The wandering Wild Turkeys are playing in the road again. This is becoming, if not a daily occurrence, at least a common one. In the question of whether turkeys are the smartest or the dumbest, I’m starting to lean towards dumbest with this group. They stop traffic, not because of their rarity, but so people don’t have turkey splattered all over the cars. And even when people stop, that doesn’t hurry them across the road. If anything, they move slower or stop entirely when a car nears. "What’s that?" they seem to say, all stopping to look at the approaching car. "I don’t know but it’s not a turkey." "Why are its eyes so bright?" "No idea. Maybe it’s an owl." "No. Can’t be. I don’t see any wings." "No, they’re not. Tom roosted in a tree with one once." "Tom was drunk on those wineberries." "Let’s ignore it. Maybe it will go away." Waggoner’s Gap is a great spot for hawkwatching both because of its general location and its specifics. As far as its general location, the gap is along the line of Appalachian ridges that stretch in a NE-SW direction across much of Pennsylvania. Raptors and other migrants often use the thermals generated along the ridges to help ease the difficulty of flying the long distances of migration. Migration is tough enough without having it be more difficult than it need be. If the birds can glide along a thermal and rest their wings for a bit, that is what makes it easier for them. Ridge tops place hawkwatchers higher up and so afford better looks at the birds as they pass. Even with the added elevation of sitting on a ridge top, it’s not uncommon for birds to fly higher than hawkwatchers can see, especially in the middle part of the day when the thermals are strongest. Better looks at the passing migrants are usually found from around 10-12 and again from 3-5 p.m., when the thermals aren’t as strong and the birds are lower. 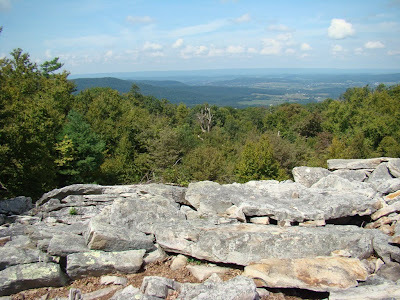 The specifics of Waggoner’s Gap’s location—this big rocky outcropping that creates an opening in the forest and affords great views —means that hawkwatchers can see the migrants approach and watch them flying past. Just having the hawks fly by a spot is no good for hawkwatchers if the area around that spot is forested or otherwise has a blocked view. Many spots are in the right location for hawkwatching. Not many have open areas from which you can actually see the hawks. Waggoners Gap has both. In today's photo, the view is to the north. What Waggoner’s Gap and indeed much of Pennsylvania does not have is comfort. If you like hawkwatching, you need to learn how to sit on rocks for hours at a time. In this state, it’s rare to find a good hawkwatching spot that doesn’t involve sitting on rocks because that's where the open areas on the mountains are. Many of the watches also require a certain amount of walking up to and over rocks to get to the spot. Even in those spots where there is room for a chair, carrying one up to the hawkwatching spot is usually not an option. Bring a cushion. 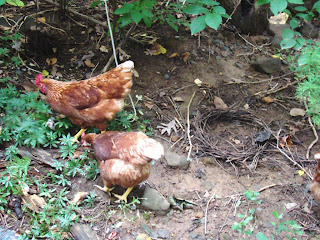 If you hawkwatch in Pennsylvania, the odds are you will need one because the rocks never get any softer. 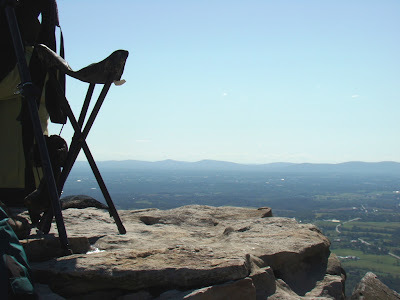 I made a trip to Waggoner’s Gap for hawkwatching over the holiday weekend. I wasn’t expecting much in the way of hawks—the season is yet early, hawk numbers over the previous week all along the east coast were still stuck in August, and the weather forecast was the same as it had been for the past week. But none of that deterred me. The time I have for sitting on top of mountains looking for hawks is far more limited than I’d like it to be, so whenever I can cobble together a few hours for my favorite activity, I go. So imagine my surprise when the hawkwatching was actually quite good. Broadwings, Sharpies, Coops, RT’s, a few k-birds, bald eagles and Ospreys, even a harrier. (What did she see, I can hear you saying). Broadwings are Broad-winged hawks, Sharpies are Sharp-shinned Hawks, Coops are Cooper’s Hawks, RTs (aka redtails or tails) are Red-tailed Hawks and K-birds are American Kestrels. The non-raptors included 4 ravens, which I also love to see. 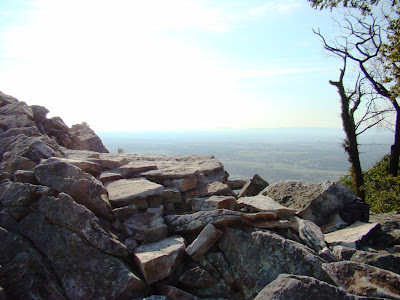 Today’s photo was taken atop the hawk watch at Waggoner’s Gap, which is along Rte. 74 some 5-6 miles north of Carlisle. 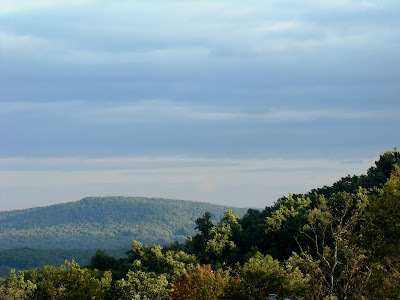 The view is to the south, and I could see Roundtop Mtn. across the valley from my perch on Waggoner’s rocks, though you can’t see it in the photo. For those who might want to visit their local hawkwatch, the peak of the Broadwing migration will be September 17-18 in most areas. Weather can push that date forward or backward by a few days, but given normal weather, that’s when these birds fly. And the peak day usually brings thousands of the birds, often circling (kettling) together in large flocks. It’s quite an amazing sight to see hundreds or even thousands in a single group, and I highly recommend that everyone partake of this amazing natural wonder at least once in their lives. My day on Waggoner’s Gap will take more than a single blog post to write about, so be prepared to hear more about it during the rest of the week. The year has reached the point where I experience a few days of discombobulation. The ever-shortening days are now poking into the rhythm of my day. The forest is nearly dead dark just a few minutes after 8 p.m. here. At 8:30 p.m. the sky is filled with stars, and I find myself yawning the way I do at 10 p.m. in the summer. I’m not about to go to bed at 8:30, but it will take a few days before I can convince my body that I shouldn’t. In the mornings now, I am literally up before the chickens, who sleep on their perches as I walk Dog and Baby Dog. Today it was hard to drag myself out of bed, and it wasn’t even cold. It was, however, very dark. I always get past this sense that I should go to sleep with the sunset and stay in bed until daylight, but it takes a while. I’m not quite there yet. The quiet around Roundtop continues on these late-summer-but-feels-like-fall days. Mist rises in the early morning but soon dissipates. Even the air is still; not even the leaves rustle. With no competition from the forest, Blue jays sound even louder than usual, and the owls sound closer than they are. Perhaps I have even more reason to enjoy this lovely weather while it lasts. The folks over at Accuweather are predicting a long, snowy and harsh winter for the eastern U.S. Click here for the full prediction. Thanks to Sam, my former boss, now blogging over at Heart Matters, for the heads up on this one. My own experience suggests nearly the opposite of this prediction, however. I have found that it’s as though the weather can’t stay untypical for too long and rights itself by going a bit further in whatever the other direction for the next season or two would be. So I have noticed that a warm winter is often followed by cooler than average spring. An untypically warm spring would be followed by a cooler than average summer and so on. Sometimes the untypically warmer or cooler weather lasts for two seasons instead of one before the correction begins, but I can’t remember three seasons in a row that were overly warm or cool. That said, as someone who usually likes winter quite a lot (I live next to a ski area, after all) I would not be unhappy to be proven wrong this time around. And truthfully, my area is due for a real winter again. It’s been some years since I’ve had one. Cool and quiet is how I’d describe the weather and the activity around Roundtop for the past day or so. The breeze is light. The humidity is low. The evenings grow ever shorter but are lovely for as long as they last. Even the mosquitoes seem to be hiding or sleeping or at least not bothersome. I am trying to learn to take the quiet as it comes and enjoy the brief respite. I know it will be brief. Quiet never lasts. Quiet is rare enough that I find changing gears to match its slower pace difficult. Quiet seems an anomaly in life. Life usually moves quickly—too quickly, of course—and my days are arranged to get as much done as possible before it gets dark, before the evening ends, before winter sets in or whatever the next event is. The quiet of these days is a signal to change those gears and slow down for a bit. Relax. Enjoy the evening as the sun slowly sets behind the mountain. Watch how the light dissipates from the forest moment by moment. 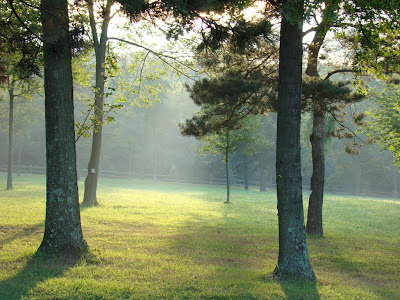 Notice how stillness creeps through the woods. Feel the warmth shiver away with the light. Hear the last call of the pewee. This, too, is important. 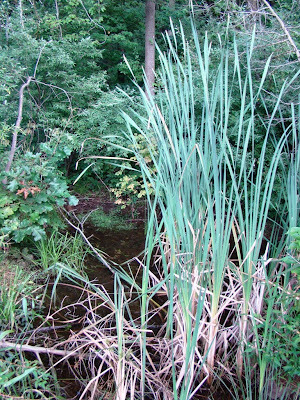 So, do I still call this a vernal pool if it lasts until autumn? Usually these little wet spots don’t make it through July, but this year they are still going strong on September 1. Last evening I found several of them, usually laden with frogs. 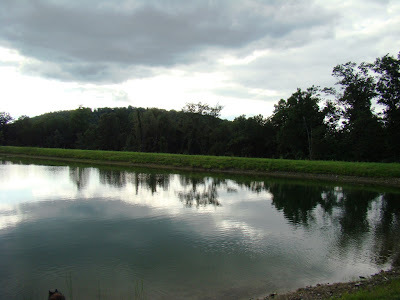 And speaking of frogs...last year I walked around Roundtop’s newest pond and counted 70-couple frogs leaping ahead of me in a kind of froggy ballet, one after the other. That was nothing. This year so many leap into the pond at the same time that I can’t begin to count them. I wouldn’t be surprised if it was 70 frogs in 30 feet. 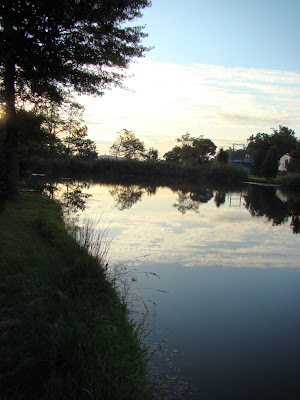 Dog and I walked along the edge of the pond last evening for just 100 yards or so, and I know we saw hundreds of them. This summer’s rainy weather was no doubt right up their alley. I’d like to think all the frogs would draw plenty of unusual shorebirds to the mountain top, but since I haven’t seen many yet, I doubt that will happen. The water level is higher than it usually is by this point in the season, and shorebirds crave mudflats. Last night the temperature dropped into the late-September range. This morning it was 52 at the cabin. The local screech owl was screeching near the cabin. I heard it when I woke up to pull a blanket over me in the middle of the night. I think it’s going to be an interesting fall—cold weather the last night of August, lots of rain in the summer. I don’t know what the fall will bring, but I’m looking forward to seeing how the new season plays out and how it is different.